Very Nice Steve! Love the detail of the flower and the dark background really makes the subject “pop”! 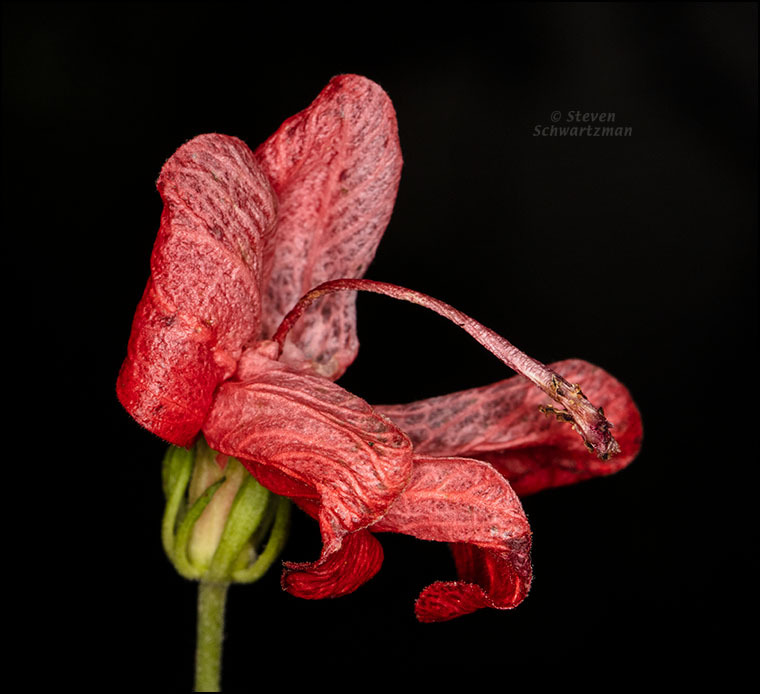 I’d never seen Turk’s cap petals forming such interesting surfaces with such veiny texture. Recording those features was my goal; the black background, a byproduct of the photo technique I used, did indeed set off the red and green quite nicely. Pop goes the Turk’s cap, you might say. It’s a very striking photo, and thanks for including the technical info, too. You’re welcome. Just call me Mr. Striking Technocrat. The surface veining is as interesting as the openness. I’m sure they’re related, though I can’t imagine how. I have seen white fly leave flowers as limp as the proverbial dishrag, but I can’t imagine white fly affecting a Turk’s cap. As a matter of fact, I was trying to find out about the pink and white varieties I saw in Nacogdoches, and learned that while RoundUp will cause some color change in the blooms, the plants seem to be resistant even to that — so some kind of herbicide overspray probably wouldn’t have done it in. In any event, it’s an interesting photo. The black background’s perfect for it. The red really snaps. You say snaps and Reed says pops. Both are fine with me. The surface texture may well be related to the openness, but I have no clue about the cause. I’d never heard of whiteflies, which I looked up. I’d also never heard of pink and white versions of Turk’s cap. Oh, the things I don’t know, and the things I’ll never know. Bud mites do that to some types of flowers. Something probably just took a bite out of it as it was growing. It’s good to know that bud mites, which I’d never heard of, can do that. As for something having taken a bite, I don’t know; nothing seems obviously chomped. Well, hopefully, you will never hear of bud mites. Hopefully this is something that you have already encountered. Some types of fungal infections can do it too, but they tend to cause more visible scarring outside as well. It is actually quite easy to ruin a developing flower just by taking a tiny bite out of the tip while developing. Bud mites do exactly that. They just taste enough to ruin a flower, but leave the rest. Then maybe that is what happened. Thanks for the suggestion. Sorry to be so long winded. I am tired. It’s beautiful. I know that feeling of getting the black background.😱but it can look great as it does here. Some photographers carry a piece of dark cardboard or something similar to create an artificially dark background. I never do that, but close flash with a small aperture can eliminate background distractions, as it did here. I like the combination of red and black. Yes, in an unkempt sort of way. Wow! I have never seen Turks Cap do this! I have several around here that I dug up in Louisiana. Hummingbirds love this! I’ve seen thousands of Turk’s cap flowers, but this one remains a mystery. Whatever its cause, it will live on in photographs and maybe provide evidence for a future explanation. Or maybe some botanist already knows, and I just haven’t come across the explanation.